Ben Earl was recently announced as part of the 31-man England rugby squad on tour in South Africa during June. He’s a regular fixture of the under-20 team and is signed to Premiership club Saracens. On top of all that, he’s just finishing his second year studying Comparative Literature in the School of Languages, Linguistics and Film. We caught up with him to find out how he manages to juggle all of his commitments. Congratulations on scoring a try in your first premiership start for Saracens in March! Can you tell us a bit about your rugby journey so far? I began playing at Under 10s at my local club, Sevenoaks. After that I was fortunate enough to be picked up by Saracens Junior Academy at the age of about 14. 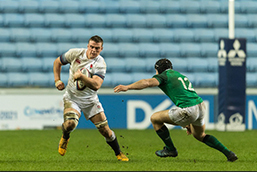 I had the honour of playing for England at under 16 and under 18, and in my last year at school I signed my first professional contract with Saracens. After that I have played for England U20s as well as making my Premiership and European debuts. So, it has been a great journey so far. You captained the U20 team in this year’s Six Nations campaign. What do you think you’ve learned from the experience? Probably the awareness of speaking to people of different backgrounds and emotional tendencies. Some people would prefer to be shouted at whilst others would prefer an arm over the shoulder. It is about knowing your players on and off the field so that you know that you can trust them in those high-pressure situations. Your performances have earned you a call-up to Eddie Jones’s England squad for the tour of South Africa this summer. How would it feel to get your first cap for the seniors? It would be unbelievable! Obviously, it is every child’s dream to play for their country and to think I have an opportunity to do that is so exciting. Are you taking any university books with you on the tour? Definitely. I hope to be doing a research project in my final year so I will be getting reading a lot of Homer! How do you juggle your rugby commitments with your university work? It is all about discipline; sometimes my attendance is not where I want it to be because of training commitments, but because of that the onus is really on me to be getting the reading done as well as watching the lectures and emailing the lecturers with any questions. Do you have much time to get involved with extracurricular activities at Queen Mary? Not as much as I would like. I think with next year being my last year I will definitely try and throw myself into a few more things. I have a few really close friends from the uni now, so we do go and do stuff in London when we can. There seems to be some confusion in the papers about what your course, Comparative Literature, entails. How would you describe the course and what are the best things about it? When people ask, I say it is English without the boring stuff! I would say it is the study of literature not just from England but from different cultures and languages such as Africa and Asia. I would also say that the degree gives you a bit more freedom of studying what you are really interested in and pursuing that. What advice would you give other students who are trying to manage a complex workload? I would probably say two things; one: have the discipline to plan your weeks ahead so you can manage expectations of the lecturers and of yourself. This will allow you to know what to read and when your assignments are due. And secondly, I would just say enjoy it! There’s not many times in life you can say you are a student as well as something else, so I guess just make the most of all the people that are around to help, because at the end of the day they only want to see you succeed.